ClickFunnels is an increasingly popular funnel building tool with its user-base quickly climbing up in numbers. What sets it apart from other tools is that it does not even compare to any other tool. Sure, it’s similar to LeadPages in that it lets users create landing pages for various uses. But the similarity stops there. ClickFunnels lets users build an entire funnel and not just a single page complete with a billing system, designer and it even lets you split test every page in your funnel! Of course, while that sounds impressive, the success of your funnel isn’t 100% ensured just because you’re using ClickFunnels. You will still need all the knowledge and know-how you can get from building high-converting funnels, creating winning sales copies to optimising your funnels to align your marketing with your sales. With that in mind, a concept for a training program was established. Funnel University, or simply FunnelU, is a training program for small business owners and entrepreneurs who wish to learn more about sales funnel and how to optimise these funnels for maximum revenue generation. But that’s not all you get from FunnelU. You’ll also learn how to create scripts, sales letters and learn how to test your funnels. The Underground Software Suite is another good reason to sign up. Joining FunnelU gives you access to Russel’s custom software plugins you can use to optimize your sales funnel conversions. Instant Survey Generator. This is one convenient tool to use if you’re one of those who usually add surveys or forms to their ClickFunnel pages. What this means for you is that you can forego the daunting task of creating surveys from other platforms and embedding or integrating them to your ClickFunnel pages. Webinar Replay Chat Box. This is another fantastic tool you wish your pages could have. This enables your webinar attendees to chat with you. ‘Push Play’ Image Uploader. Uploading images has never been so easy with this tool. A ‘play button’ is added to display thumbnail of every image which lets you instantly upload these images to amazon for hosting. This is pretty convenient to use for emails and blog posts. This digital access pass allows you access to all the FunnelU content, old and new, through the membership site. The content in this site is updated monthly. With this, you will also receive an exclusive access to previous DotComSecrets lab reports and tests, some of which haven’t been released before. Now, this book is a total gem. 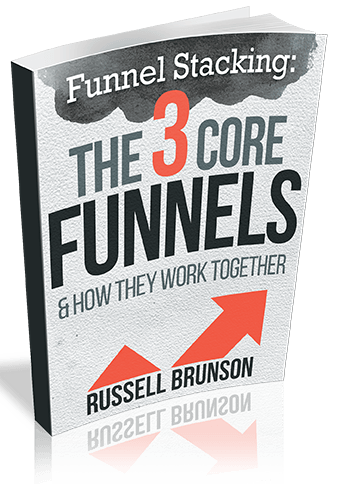 It’s jampacked with everything you need to know about the 3 core funnels – what they are, why they work and how to build them in a very detailed format. Here, you will also learn what powerful scripts to use, how to leverage these 3 funnels in your business, and so much more! This gift is valued at $497, which you will get for free, is one pretty nifty tool. It’s a usb device which looks like an ordinary credit card. You can even carry it around in your wallet! This fantastic tool houses powerful video trainings where you will learn valuable information to help you make the most out of your sales funnels. It has everything from funnel hacking, funnel building, copywriting, and more! Funnel University offers two payment plans which will suit any type of budget. The great thing about this is you can avail of the 14-day Free Trial to enable you to try it out before deciding to sign up. Two weeks is more than enough time for you to check out FunnelU and decide to sign up. The monthly membership subscription comes with a 14-day free trial. You will be charged with the monthly membership fee after the free trial is over. With a regular of $197/month, the monthly membership fee is available for the price of $67/month for a limited time. This payment plan is convenient if you do not have the money to spare for the annual fee in one go. With a regular price of $2364/year, you can avail of 1 full year of access to FunnelU with just $597/year for a limited time. While the monthly membership is a convenient payment scheme, the yearly membership payment offers more benefits in terms of savings. If you choose to pay the yearly membership fee, you get to save $207 as opposed to paying the monthly fee for 12 months. 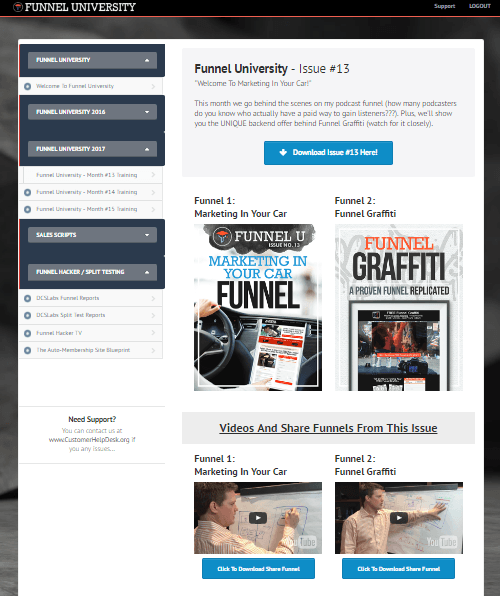 The membership site is Funnel University‘s content hub where you’ll find all the previous and recent monthly training videos. Here’s what the dashboard looks like. The membership site also serves as a portal to download more reference and training materials such as the DotComSecrets Labs Funnel Reports and DotComSecrets Labs Split Test Reports. It also contains sales script creation trainings, similar to that of Funnel Scripts. The difference is that you will have to manually create the script using the downloadable template and it is only limited to six kinds of script. As discussed earlier, you can avail the 14-day free trial. Signing up for the free trial also entitles you to redeem the two freebies that come with FunnelU and all you have to pay is the shipping and handling cost of $19.95. In the event that you do not find yourself satisfied with the freebies you received, all you have to do is to email Russel your receipt number and he’ll refund you your payment without obligating you to send the freebies back. The same is true with the subscription. Should you decide to discontinue your membership, you can do so at any time and you still get to keep the freebies. This only proves how confident Russel is about the quality of the freebies and FunnelU itself. Funnel University offers value like no other. Imagine having to pay for all the freebies and benefits. That would cost you $7085 in total! In reality, you would only have to pay a monthly membership of $67/month or $597/year if you choose the annual payment plan. You get more than your money’s worth in resources and tools. And that doesn’t even include future increase in revenues once you apply everything you’ve learned from FunnelU to your funnels. I also like how you can expect a monthly print copy of the newsletter and an actual usb device in a unique form . I find the novelty in receiving something tangible from online subscriptions, a refreshing respite from everything digital. Someone from Bolton built a funnel 13 minutes ago. Someone from Wellington built a funnel 16 minutes ago. Someone from Wellington built a funnel 17 minutes ago. Someone from Trikala built a funnel 8 minutes ago. Someone from Palermo built a funnel 36 minutes ago. Someone from Edinburgh built a funnel 12 minutes ago. Someone from Jackson built a funnel 51 minutes ago. Someone from Edinburgh built a funnel 28 minutes ago. Someone from Crete built a funnel 1 hours ago. Someone from Glasgow built a funnel 3 hours ago. Someone from Auckland built a funnel 3 hours ago. Someone from Bristol built a funnel 1 hours ago. Someone from Springfield built a funnel 2 hours ago.